The Motorola LS3008 rugged hand-held scanner has a lightweight ergonomic design for superior productivity in light industrial, healthcare and retail environments. Designed to deliver maximum reliability and uptime, the single-board construction eliminates multiple circuit boards and connecting ribbon cables — the most common point of failure in scanners. A multi-line rastering scan pattern eliminates the need for exact aim and positioning and a wide working range allows easy scanning. Liquid Polymer Scan Technology eliminates friction and wear, and superior motion tolerance reduces fatigue and increases productivity. Allows safe wipe-down and sanitisation for clean manufacturing and hospital environments. Toggles between hands-free and hand-held modes for maximum productivity and comfort. 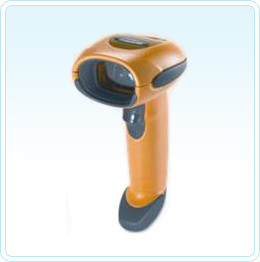 Scanner warranty Subject to the terms of Motorola's hardware guarantee statement, the Symbol LS3008 hand-held scanner products are guaranteed against defects in workmanship and materials for a period of three (3) years from the date of shipment. How do I add an 'Enter' key to the end of the data? Go to page 192/193 of the User Manual and scan: "Scan Options", then "Data/Suffix", then "Enter".